Britain’s largest ever warship, aircraft carrier HMS Queen Elizabeth, is due to sail from her Rosyth dockyard on her maiden voyage today. The 65,000-tonne ship will leave the yard and then wait for low tide for a few hours before starting her own main engines and passing underneath the Forth Bridges, which are just downstream from the dockyard. Her main mast will have to be specially lowered to allow the carrier to pass underneath. Sky News reports that the carrier’s helmsman, Chief Petty Officer Andrew “Sticky” Vercoe, will have the unenviable task of keeping the ship on course when she squeezes out of the dockyard. The ship, measuring 39m (128ft) abeam at the waterline, will have just 35cm (14”) clearance either side and 50cm of water clearance between her hull, the riverbed and the surrounding dockyard. HMS QE will carry a crew of around 700 on her maiden sailing, the Guardian reports, adding that her captain, Commodore Jerry Kyd – who, in accordance with naval custom, wears the slightly junior rank of Captain RN as commanding officer of his ship – seemed “remarkably relaxed” about taking her to sea. After six weeks of trials in the North Sea QE will return to Rosyth for any required tweaks to be made before a final three week period of trials. Following those, she will then sail for her permanent home at HM Naval Base Portsmouth – “hopefully at the end of the year”, in Captain Kyd’s words. The £3.5bn ship has been repeatedly delayed during the decade or so that she was under construction. In February this year defence minister Harriett Baldwin was unable to tell Parliament's Defence Select Committee when the carrier would sail. Her previous sailing date had been given as March this year and was originally planned for late 2016. Prior to QE, the last true aircraft carrier to sail under a British ensign was HMS Illustrious. That ship's Harrier air wing was scrapped in 2011 as a result of the Strategic Defence and Security Review carried out by the Conservative-Lib Dem coalition government in 2010. Since then the UK has had no fast jet aircraft carrier, with our remaining flat-top ships reduced to helicopter carrier duties. While still highly demanding, a different skillset is needed to operate fast jets from a moving deck at sea. It is entirely likely that Russia will follow QE’s sea trials with great interest. Though the North Sea is relatively shallow, as oceans go – a mere 90m deep on average, compared to thousands of metres for the Atlantic – the RN can expect Russian submarines to be snooping around trying to record the carrier’s unique acoustic signature. In turn the sea trials will need a fairly substantial naval security operation; one could expect a hunter-killer submarine, a frigate or two and probably some allied maritime patrol aircraft watching the seas for Russian intelligence-gathering trawlers, in addition to the RAF’s usual quick reaction alert (QRA) from RAF Lossiemouth to chase off marauding Russian aircraft. Most of these assets will probably be borrowed from the US and NATO, given the current state of the Royal Navy. QE is very much dedicated to the US for her first operational deployment in the early 20s, with around half a dozen US Marine Corps F-35Bs being carried as part of her air wing of 12 fighters. The carrier will deploy to the South China Sea, among other areas – traditionally not a place that Britain pays much attention to but one of great interest to the US as it confronts Chinese expansionism in the region. So much for the “2017” claim on the image data – the carrier pictured in Number 2 Dock is HMS Invincible, as betrayed by the great big N at the rear of her flight deck. She was scrapped in Turkey in 2011. 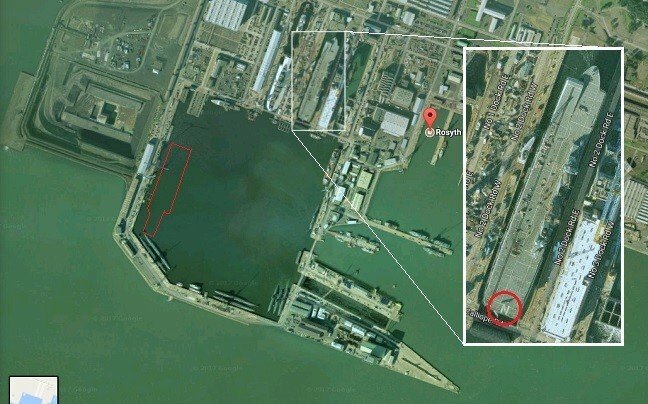 The red outline is roughly where HMS QE is berthed at the moment. She will have to pass through the basin entrance at the right of the picture, aided by a small flotilla of tugs and men in hi-vis jackets shouting "left hand down!"